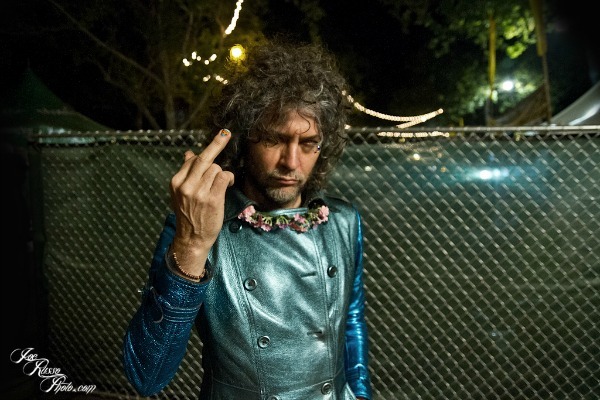 Few folks have done more to keep rock weird and dirty and connected to its earthy, establishment rattling roots than Wayne Coyne of The Flaming Lips. The best part is Wayne doesn’t seem to need to try at any of this – he’s a genuine, dyed-in-the-wool freak – so what flows from him just feels naturally psychedelic, in the most positive sense of the word. Been hoping to add Coyne to our rogues gallery of musicians raising a middle finger for a while, and Joe Russo caught him in a receptive mindset backstage at the inaugural Bottle Rock Festival in Napa, CA. Diggin’ the painted nails, man, and that expression hints at things we don’t even want to conjecture about. Thanks for caring enough to flip off the Impound, man!